Walker's Baby & Kid's Folding Ear Muffs are designed especially for babies and children, and they're packed with thoughtful, helpful features for kids. The ear muffs are ultra lightweight, so they won't strain your baby's neck. They're also fitted with low-profile ear cups, which are padded and soft. The headband is also padded, so every contact point where the ear muffs rest against your baby's head is plush and gentle. The headband is also adjustable, so the same set of ear muffs can be used from ages 6 months all the way up to 8 years! Hearing Protection - Start Early! Hearing protection is never more important than when it's protecting little ears from distressing and damaging noise. Babies have highly sensitive hearing, as yet undamaged by years of exposure to loud music, engine noise, power tools, etc. But noise-induced hearing loss is cumulative and permanent - so it's critical to give your child a head start by keeping their delicate ears safe. Also, it's worth mentioning that we live in a very noisy world. The noise levels around us can be overwhelming, even for adults! By equipping your baby with good hearing protection, you can provide your little one with peace and quiet virtually anywhere. Imagine your baby napping peacefully while you travel, or while you enjoy a sporting event, or even while you're at a concert! Make fun family outings easier on infants and toddlers (and on the adults, too) with a simple set of ear muffs. These passive (non-electronic) ear muffs provide NRR 23 protection from noise. This is enough to keep your child's hearing safe at noisy events, from live concerts and music festivals to boat rides and NASCAR races. NRR 23 is a nice, moderate amount of noise blocking - enough to cut the volume and prevent hearing damage, but not enough to completely block out the whole world. Your child can choose to take in the action, or just take a nice nap. These ear muffs are perfect for enjoying events together as a family. 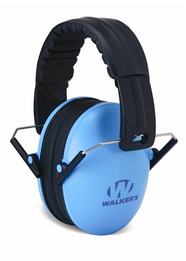 Walker's Baby & Kid's earmuffs fold up for easy storage and transportation. Your child's noise protection is always ready to go - just fold up the ear muffs, and the family can enjoy loud events together. Consider child hearing protection for fireworks, parades, motor races, stadium sports events, and especially for concerts and other loud music. Available in lime green, blue, pink, and camo. Walker's GWP-FKDM Baby & Kid's Folding Ear Muffs (NRR 23)4HollySeptember 30, 2018These seem very well made, but they clamp so tightly they are uncomfortable. Also, they fold up so readily that it is difficult to UN-fold them. Tricky for child to put them on by himself. We had much better luck with the Peltor earmuffs.